It’s been a turbulent start to the season at Old Trafford. After a disappointing summer transfer window, Manchester United already find themselves six points off the Premier League leaders. Defeats at the hands of Brighton and Spurs have left Jose Mourinho under intense pressure, while Chief Executive Ed Woodward has been the target of most fans’ discontent. Although the Red Devils showed vast improvements last season, this campaign has already become shrouded in negativity and pessimism, as the fan base stands on the brink of complete division. However, one thing that all fans can agree on is just how beautiful their brand-new away kit is. adidas kicked things off earlier this summer by unveiling United’s stunning 2018/19 third kit, while the new home kit arrived just a few weeks later to mixed reviews. So, quite naturally, fans have spent the past month or so speculating on what the away kit will look like, as adidas continued to leave us in suspense and build up hype. Well, it looks as though the new strip has been worth the wait, because fans have been left salivating after finally getting their first glimpse of the new design. In fact, we’d probably put this up there as one of the top Premier League kits of the season. As you’ve probably noticed, the new design is pink. Very pink. Of course, we’ve seen similar things from the Three Stripes in the past, with their famous pink Real Madrid and Juventus shirts. 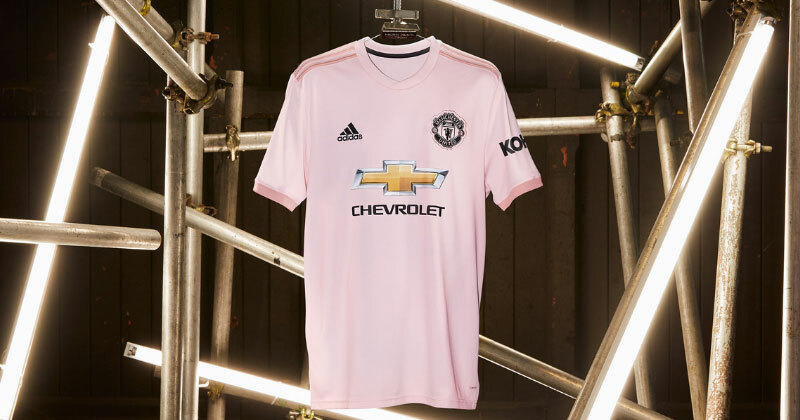 However, this is the first time Manchester United will take to the field in an all-pink number, with the mellow tones contrasting completely with their whirlwind start to the season. The pink colourway is brought to life by crisp black logos and sponsors, while the classic adidas stripes sit in a slightly darker pink on the shoulders. Similar detailing can be found on the cuffs, too, as adidas provide us with a kit that looks great on both the street and the pitch. But it’s not all about just looking pretty in pink, because these contemporary shades have a much deeper meaning: they draw inspiration from ‘The Pink’, a famous Manchester Evening News publication which has always been popular with United fans. The new strip was shown off last weekend at Turf Moor, as United clinched their second win of the season against a sub-par Burnley. Pundits suggested that Dyche’s men were tired from their Europa League duties, but we reckon they were just distracted by United’s awesome new kits. Bold, fashionable and bringing some much-needed freshness to Mourinho’s camp, this football kit might just have arrived in the nick of time.